I’ve been wearing some gorgeous tichels lately, but it’s been hard to get good photos of them because I’ve been all distracted with our yummy baby. 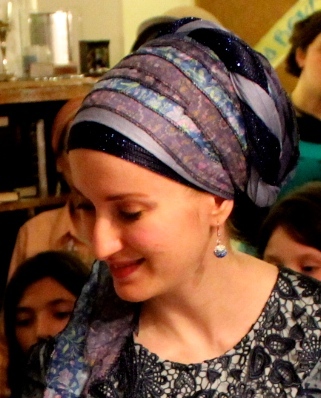 This past motzei Shabbat we had a pidyon haben, and a friend snapped this photo of what I was wearing. It’s a sari sash, navy shimmery, and light blue 2 in 1… loved wearing it! It went perfectly with this dress that I got in Israel. Check it out! I loved this outfit… I was able to combine many shades of blue together and it just made me feel so serene and happy. Have you ever had a simcha (happy, often formal occasion) and you were super sleep deprived and short on time, but you managed to put together an outfit and feel fabulous? Would love to hear your experiences! ← Wrapunzelistas Do the “Liezl”!!!!! Your face and eyes are shining! What a proud and beautiful mom! Much nachas! you look great, new mommie! mazel tov!! you look lovely!! may you raise your sweet baby to torah chuppah and ma’asim tovim, in good health and simcha. Gorgeous! This makes me want a blue sari scarf even more!! So regal and perfectly understated for a classy formal occasion. Love it! WOW! I love it ! The tichel and the dress which suits you perfectly ! The blues are wonderful, the dress is magnificent, but the woman wearing it all is the star. Mazal tov to you and your husband on this second of — Be”H — many happy moments with your son (the first being his bris). congratulations! What a beautiful Mama & what a joyous occasion! Andrea you look radiant. Motherhood is definitely agreeing with you. I’m so impressed. I managed a nice tichel for my daughter’s simchat bat only by using a stand-alone tichel braid that I’d done at a previous point, and just put on over a very basic tichel. An I didn’t do anything exciting with my scarves at all for the first couple of months. First of all, Mazel Tov! Second I love everything: the colours and combination of the dress and tichels. I’d like to try this, except I would have to use a full sari, as I don’t have a sari sash. 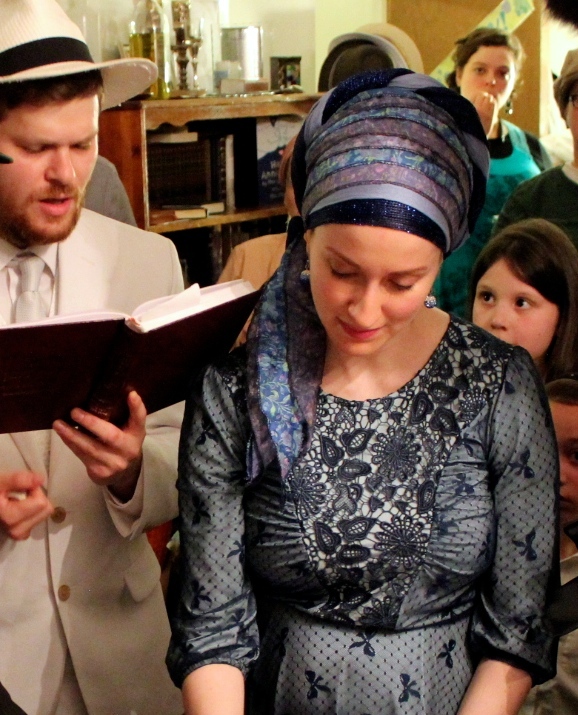 blessings to youand the family and indeed you ad your tichel look just gorgeous! Mazel Tov!! I’m so impressed that you are managing to put on your gorgeous tichels with the baby. My baby is 7 weeks old and I manage to get 1 simple tichels on if I’m lucky. But usually home with a snood these days. You should have much nachas from your little one. I didn’t even realize you were expecting a new little one. Such a wonderful blessing! Mazel Tov! And you look as gorgeous as ever, too! Shalom to you and your beautiful family!